Today’s defence related news includes coverage of the Operational Honour and Awards and specifically Lt Col Craig Palmer and his award for bravery. BCC Breakfast, Sky News, BBC Online, The Telegraph and The Herald all report on Lieutenant Colonel Craig Palmer of the Royal Regiment of Artillery who has been awarded a Queen's Commendation for Bravery (QCB) following his actions during the Parsons Green terrorist incident in 2017. 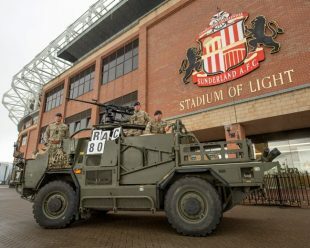 One British army Jackal and its crew parade next to Sunderland A.F.C The Stadium of Light football ground to celebrate the Royal Armoured Corps' 80th birthday.